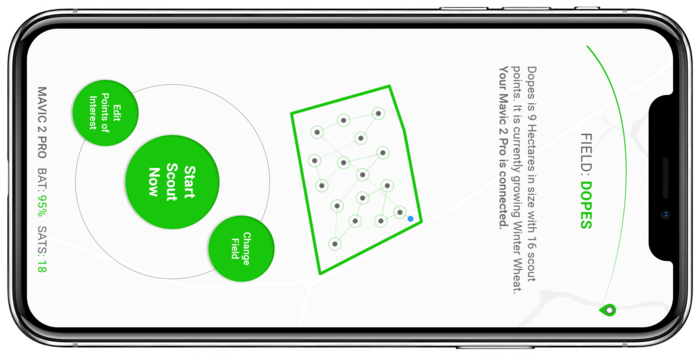 You are at:Home»Crops»New app that uses drone to make walking fields a thing of the past. New app that uses drone to make walking fields a thing of the past. DroneAG has launched a first-of-its-kind app that scouts fields for you, in less time and in more detail. All you need is a smartphone and a small drone. After choosing a field the Skippy Scout app flies your drone for you, collecting high resolution imagery at various points in the field. These are downloaded straight to your phone and can be analysed for Growth Stage, Green Area Index, Weeds and Disease. You can then share the data from your phone at the fields edge. Drone AG has been offering farming-focused drone systems and certified training for over 3 years, and this is their first move into software which is a fast growing area in modern agriculture. Flying drones professionally needs a licence from the CAA. This means those that provide services to others, such as Crop Consultants will need to do a 2 day course and flight test to obtain their PfCO (Permission for Commercial Operations from the CAA). However the CAA has recently confirmed that a farmer operating a drone on their own land does not need a commercial license. “As the technology develops and becomes more intelligent, flights beyond line-of-sight will become safe enough to allow and we’ll start to see true drone automation on the farm. Using a drone to scout a field is just the beginning of our goal to develop super-simple software that uses drones (not just airbourne! ), smart phones, automation and AI to enable more efficient farming, with less hassle, says Jack. The Skippy Scout app will be free during its launch and testing phases, starting in November.